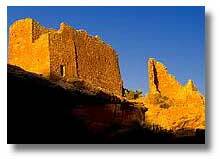 The name Hovenweep is a Ute word meaning "deserted valley." It refers to a series of small river valleys that feed into lower McElmo Creek and the San Juan River from Cajon Mesa on the Utah-Colorado border. Although this region was probably visited by nomadic hunters as long as 14,000 years ago, it was the Anasazi who occupied this area from about 500 to 1300 AD and who built the masonry towers and pueblos which the Monument protects. These structures were discovered in 1854, more than 30 years before the more famous cliff dwellings at nearby Mesa Verde. Hovenweep was set aside as a National Monument in 1923 for protection and preservation. These structures at Hovenweep are numerous and varied. Some are square, some D-shaped, some round, some almost four stories tall. The exact purpose of the towers is uncertain, but guesses include celestial observatories, defensive structures, storage facilities, civil buildings, communications towers and ceremonial buildings. Only limited archeological work has been done at Hovenweep. None of the structures have been rebuilt and remain standing after 700 years. The Anasazi were very successful dry farmers. They terraced their land into farmable plots, formed catch basins to hold water and built check dams to retain soil that would normally wash off the cliffs by erosion. By the end of the thirteenth century, the people of Hovenweep and the surrounding region (such as Mesa Verde and Kayenta) packed up and disappeared from the region moving southward. Several theories have been proposed as reasons for the Anasazi's departure, including drought, overpopulation and disease. 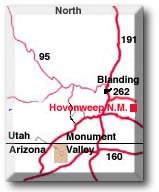 The six major Hovenweep site groups are located within a 20-mile drive of each other along the Utah-Colorado border. These units vary greatly in size, the largest of which is the 400-acre Square Tower Group. Both this group, where the Ranger Station is located, and Cajon Ruins are located in Utah. The Colorado sites are Holly Ruins, Hackberry Canyon, Cutthroat Castle and Goodman Point. Altogether, Hovenweep National Monument encompasses 785 acres. Entrance fee: $6.00 per vehicle or $3.00 per individual or cyclist for 7 days. Good for entrance to Arches, Canyonlands, Hovenweep and Natural Bridges. Camping: $10.00 per night. All sites are first-come, first-served. Open year-round except closed on winter holidays. Hours: 8:00 AM to 5:00 PM, winter; 8:00 AM to sunset, other seasons. The visitor center contains exhibits and educational information for visitors. There is a small sales area with books specializing on the cultural and natural history of the area. No reservations are taken. Special tours can be arranged with notice for school groups. Soda, water and candy-type snacks are available at the Ranger Station. Complete foods and supplies are available in Cortez, CO or Blanding, UT. The Ranger Station and restroom are wheel chair accessible. Trails are uneven and primitive. Some trails can be negotiated with assistance and rough terrain chairs. RV and bus parking at Ranger Station overflow area. A video is available for those not able to take the walking tour of the sites. It is the visitor's responsibility to know and obey park rules. Regulations are designed for visitors' protection and to protect natural resources. The archeological sites are extremely fragile. The monument contains areas of crypto- biotic soils, which are very prone to damage and require years to heal. All types of climbing on the ancient walls, picking up artifacts or other such activities prohibited. All hiking is limited to established trails only. No overnight stays are permitted at any of the sites. Mountain bikes are limited to roadways. Mountain biking areas can be found on other public lands in the area. Spring and Fall are the most ideal visit seasons. Summer visits are recommended before 10:00 AM when temperatures are moderate. Winter travel is discouraged in late afternoons due to remote location and possible storms. From Cortez, CO: Travel southwest on U.S. Highway 160, 4 miles south and west on County Road G (airport roadway) 41 miles. From Blanding or Bluff, UT: Turn east off of U.S. Highway 191 on Utah Route 262 to the Hatch Trading Post. Follow the Hovenweep signs, 16 additional miles. Summer: 95-100 degree F days; 60 degree nights. Fall and Spring: Best for hiking. Light jackets are recommended, especially in the windy spring season. Winter: Temperatures vary, snow is usually light to moderate with cold nights and sunny but chilly days. Biting Pinyon Gnats are common in late May. Bug repellent is advised. Road conditions change rapidly with storms. Some area dirt roads become impassable during and after storms. Picnic tables are available at the Ranger Station area. Due to the high cost of trash removal, this is a designated trash free park. Pack out all trash. The trail systems here are primitive and lightly maintained. Two trails originate at the Ranger Station and offer either a 2-mile or 1/2-mile of archeological site viewing. The 2-mile trail takes about 1.5 hours and has a 300-foot elevation change. The short trail is relatively level and allows many visitors to enjoy these archeological sites. There is also an 8-mile trail that connects two of the site groups. Other trails are available at the various outer sites. Contact the Monument for further information about seasonal availability. There is no lodging available in the Monument. Motels are available in Cortez, CO or Blanding, UT. Click on city for rates, availability and reservation online. The 26-site Hovenweep Campground is available year-round on a first-come, first-served basis. There is no hot water, no showers and no dump station. Vehicles longer than 26 feet are discouraged. Fee is $10.00 per night per site. Monticello, Utah: 61 miles northwest on U.S. Highway 191. Blanding, Utah: 40 miles west on U.S. Highway 191. Cortez, Colorado: 40 miles east on U.S. Highway 160. Dolores, Colorado: 57 miles east. Mesa Verde National Park: 52 miles east of the off U.S. Highway 160. Natural Bridges National Monument: 80 miles west via Utah Route 95. Newspaper Rock Historical Monument: 87 miles northwest. Canyonlands National Park (Needles District): 123 miles northwest. Four Corners Monument: 52 miles south on U.S. 160. Manti-La Sal National Forest (UT): 60 miles northwest. San Juan National Forest (CO): 60 miles northeast. Edge of the Cedars Museum: 40 miles west on U.S. 191 at Blanding, UT. Cortez CU Center (Museum): 40 miles east in Cortez. Anasazi Heritage Center (Museum): 57 miles east near Dolores, Colorado. Lowry Pueblo Ruins (CO): 60 miles northeast. Crow Canyon Archaeological Center (CO): 40 miles east near Cortez. Ute Mountain Indian Reservation (CO): 22 miles east.